Cathedral Range and reflections at sunset, Yosemite. We huddled under trees for about an hour, waiting out a rainstorm, and were rewarded with this beautiful sunset. Every summer we get periods of monsoonal moisture pushing up into California from the south, producing afternoon showers and thunderstorms. 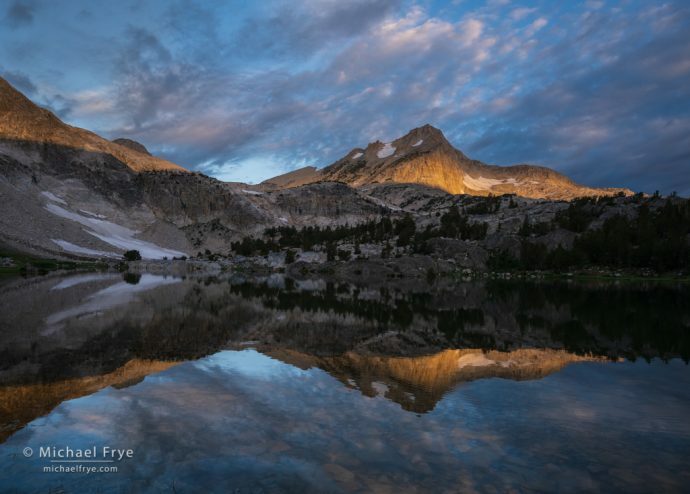 One of those periods coincided with our recent workshop in the Yosemite high country, and we got to photograph some beautiful sunrises and sunsets. On the second afternoon of our workshop we hiked over a ridge to an alpine lake basin. There were some thunderstorms in the area, but none were very close when we started our hike, so I thought we might stay dry – and we had rain gear just in case. 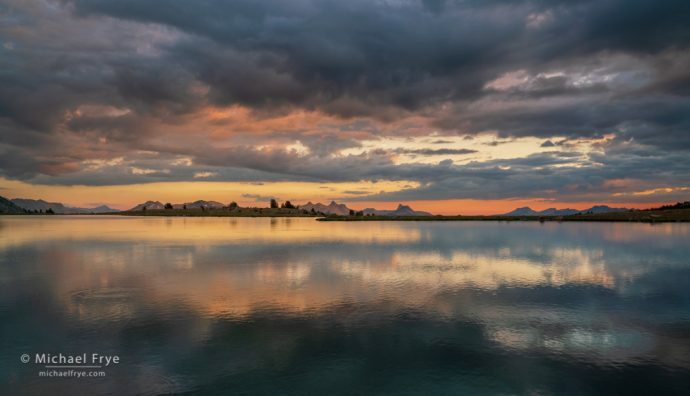 I knew that thunderstorms often dissipated late in the day as temperatures cooled, plus the skies remained clear to the west the whole time, which meant the sun could sink underneath the clouds and light everything up at sunset. Which is exactly what happened. The rain and thunder stopped about 45 minutes before sunset. Soon thereafter a slice of rainbow appeared to the southwest, though unfortunately it wasn’t next to anything interesting. We made our way back to the lake, where we found beautiful clouds, colors, and reflections, which you can see in the photo at the top of this post. Sometimes you have to risk getting wet to catch a good sunset. Luckily we didn’t have to dodge any other rainstorms during the workshop, but we caught several more sunrises and sunsets with interesting clouds. You’ll find a few of those images below. I always love the summer monsoon season. 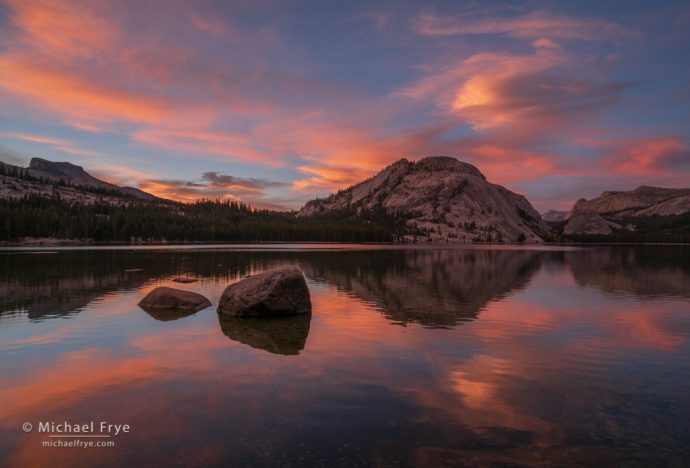 Sunset, Tenaya Lake, Yosemite. I photographed this sunset while scouting for the workshop. 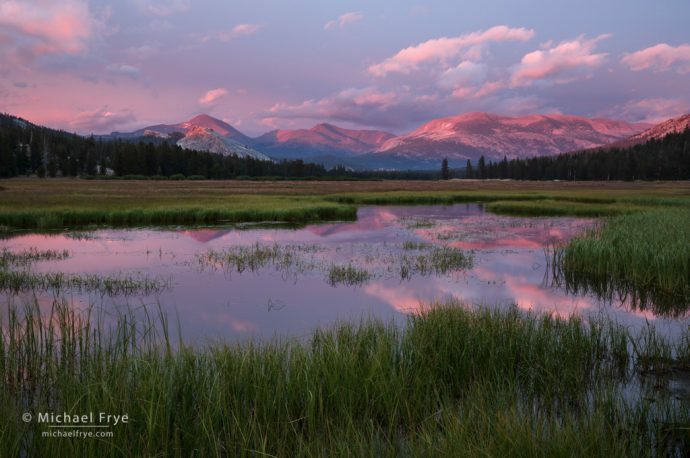 Sunset, Tuolumne Meadows, Yosemite. The sun broke through briefly at sunset on the first evening of our workshop. Peak at sunrise, Hoover Wilderness, Inyo NF. The sun broke through the beautiful clouds just after sunrise to light this mountain. Each and every one of these photos are absolutely beautiful. Currently concentrating on shooting at rodeos — continuous fast action with endless drama. It’s really something to photograph. Part of my youthful heritage. Hope you and Claudia are doing well. Thanks Alyn. The rodeos sound like fun.